On a recent trip to Morocco, I had the chance to partake in a variety of Moroccan tea experiences. There has been much written about Moroccan mint tea on this blog (and rightly so – it is a tea worth writing about! ), including how to make it, teahouses where you might sample some, pouring techniques, reviews of some existing versions, and many more. Without wanting to belabour the point too much (the point being that Moroccan mint tea is well worth exploring! ), my Moroccan travels revealed some further dimensions to the Moroccan tea experience that I was previously unaware of. The basic Moroccan Mint tea recipe combines Gunpowder green tea with fresh mint leaves and sugar (lots of sugar). The amount of sugar varies according to what part of the country you are in, but tea is generally a little sweeter in the north than in the south. 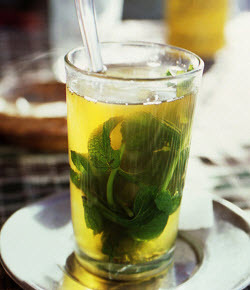 However, in addition to the mint, Moroccans often add other herbs into the tea, giving it a wider palette of flavours. The two most common herbs added to tea, and the ones that you will constantly stumble across when in Morocco, are sheeba (or cheba) and louiza. These are the herbs’ dialectical Arabic names, and initially I thought they were herbs that I was unfamiliar with. Upon closer inspection (and closer smell), it became clear that louiza was, in fact, lemon verbena. As such, adding louiza to the tea gives it a subtle lemony tone, which complements the strong mint flavours nicely. Sheeba was not a herb I recognised, but some subsequent research revealed that it is the herb known to English speakers as wormwood. Wormwood is the same herb used as one of the ingredients in making absinthe, and has historically been used in Europe to spice mead and as a replacement for hops in beer. The addition of sheeba to Moroccan mint tea makes for a bit of a bitterer brew. But the effect is not so strong as to put the drinker off (especially since the tea is already very sweet). In fact, the addition of a slightly bitter herb can be just the thing to balance out the sweetness, and might be a preferred addition for those who err on the side of less sweet tea. You might be tempted to ask why, if you wanted a less sweet tea, you would not just request a tea with less sugar. But be warned: the concept of little or no sugar in the tea is not something on the radar of all Moroccans.